Vintage Pen Catalog: Pens with Unusual Nibs: XF, B, firm, etc. 6939: A. A. Waterman twist-filler: black hard rubber slip-cap with gold filled hand-engraved floral pattern overlay, 14.4 cm long, "F.O." on barrel, marked "NOT CONNECTED WITH/THE L.E. WATERMAN CO."; #2 AA nib is tightly sprung and somewhat toothy, overlay metalwork is in excellent condition but for a small area of age speckling on the barrel and some corrosion around one cap breather hole (see detail). 9987: Aikin Lambert eyedropper-filler: black hard rubber slip-cap with lattice-like floral gold filled overlay in relief; 13.3 cm long, unusual but characteristically Aikin #1 nib with round vent hole behind but not connected to the slit, ribbed section; barrel engraved "A/AND/C", metal very clean with no brassing, only a few shallow flat spots on cap crown, hard rubber nice and dark. 11968: Aikin Lambert eyedropper-filler: black hard rubber taper-cap with pearl slabbed barrel; 14.1 cm long, gold filled trim, ribbed section, #3 nib; excellent quality and condition, thicker barrel than is usual with Aikin Lambert and Waterman pearl-slab taper-caps. 13943: Aikin Lambert Mercantile: unusual red hard rubber lever-filler, 14.05 cm long, gold filled trim, with a #2 Aikin Lambert nib, but the pen itself is the size of a Waterman 55 and was likely made using Waterman reject parts (both cap and barrel have tiny black specks and surface pits); name on barrel, condition otherwise factory new, came to us clearly never filled. 11383: American Fountain Pen Co. Moore's Non-Leakable in box: smooth black hard rubber retracting-nib safety, 14.4 cm long, crisp and glossy, long-tined American-marked #2 nib writes an elegantly shaded line. With original paper band on cap noting that the pen was sold already filled, instructions, and lower half of original box. Has not had barrel seal replaced, not guaranteed ink-tight. 13802: Artbrown safety: unusual and interesting mix of styles, Vac-like end jewels, cap like an early 1940s Waterman Emblem Pen; 11.7 cm long, gold plated trim, nib is gold plated stainless steel, cap and barrel appear to be lacquered hard rubber. Internal spiral has been repaired, seals replaced. Japanese-made safety pens are uncommon. 7259: Aurora Olo: red pearl button-filler, 13.2 cm long, chrome plated trim, bold barrel imprint, Olo #3 nib has scant iridium and is rather draggy, but very flexible; filler button is an old replacement, as also appears to be the case with the blind cap (which lacks a metal end cap). 10790: Autofiller twist-filler: oversize black chased hard rubber slip-cap, 15.7 cm long, crisp and glossy, bold imprints, big #8 Autofiller nib is toothy, much like a Victorian dip pen, wide double-vented feed, twist knob is a replacement copy in hard rubber to original dimensions. 12727: Bayard 824: slender black slip-cap accordion-sac pump-filler, 13.5 cm long, gold filled trim, made in France, original chalk marks on barrel, never filled, original sac intact, 18K gold Bayard nib. 7628: Chilton pneumatic-filler: black hard rubber ringtop, 11.6 cm long, gold filled trim with fancy triple banding at top of cap; barrel imprint worn but legible, replacement warranted nib; no brassing, typical chipping to edge of barrel end plug (see detail). 9635: Conklin 2: black hard rubber slip-cap crescent-filler, gold filled trefoil filigree overlay, 12.8 cm long; very clean early pen, narrow feed, teardrop vent hole in nib, unmarked crescent; only significant flaws are tool marks on the crescent and a crack in the hard rubber at the very top of the cap -- otherwise near mint. 12240: Conklin S3: mottled hard rubber slip-cap crescent-filler, 13.4 cm long, nickel plated trim; narrow "keel" feed, #3 Conklin nib is toothy, like a steel dip pen, crack from vent hole should be stable if not flexed; even wear, imprints worn but present. 13510: Conklin 3: black hard rubber slip-cap crescent-filler with gold filled trefoil filigree overlay, 13.3 cm long, notable easy-opening #3 nib with narrow feed, engraved monogram in cap cartouche, shallow bumps to cap crown, overlay otherwise nice and clean. 13578: Conklin crescent-filler: black hard rubber with iconic "stars and stripes" gold filled overlay, 13.2 cm long, #2 nib with earlier narrow feed, no brassing to clip, only minor mars to the overlay, engraved name in cap cartouche. Repaired crack in raised barrel threads, properly sleeved for strength. 11482: Conklin Senior Endura: rare oversize black hard rubber crescent-filler (nearly all Enduras were made as lever-fillers),14.5 cm long, gold filled trim, early production with long Duragraph-style cap, #7 Toledo nib. Imprint worn but legible, some scratches to barrel (see details), otherwise sound and with minimal plating wear. 7261: Conklin Endura: oversize woodgrain hard rubber flat-top lever-filler, 13.5 cm long, gold filled trim, big Endura nib; barrel imprint is worn but mostly legible, section is black hard rubber, not woodgrain -- probably an old replacement. 9416: Conklin Senior Endura set: oversize woodgrain hard rubber lever-filler, 13.45 cm long, gold filled trim, no brassing, barrel imprint worn but mostly legible; with matching but smaller (12.25 cm long) Endura pencil, uses 1.1 mm lead, both pen and pencil have same name on barrels, pencil shows more use. 13344: Conklin Endura Imperial set: scarce and desirable deep purple and metallic gold lever-filler, 12.6 cm long, gold filled trim, with matching 1.1 mm pencil; more wear to pencil, pen has no brassing on clip, excellent color and strong imprints, but has had a shallow name stamp removed right above the barrel imprint, leaving the surface only very slightly out of round. The purple and gold "Imperial" model was offered for only a short time, and only in standard size. Material unfortunately is difficult to photograph well, looks black instead of actual deep purple-blue. 11685: Conklin Senior Endura set: black and pearl oversize lever-filler, 13.35 cm long, gold filled trim, matching pencil uses 1.1 mm lead. Both well worn, with later narrow clips, pen has one tiny starburst age crack near top of cap and a stable hairline at the base of the massive Endura nib (see details), not collector condition but impressive users and fully functional. 10946: Conklin Nozac: rare vest pocket size piston-filler, 11.4 cm long, black with gold filled trim, original price sticker, perfect barrel transparency with herringbone pattern; mechanism in excellent working order, original piston seal has not been replaced and is probably not ink tight. 11839: Eagle pull-filler: large black chased hard rubber screw-cap, 14.8 cm long, gold filled trim, unusual filling system is like a reverse button-filler, end knob is pulled to flatten sac (US patent 680117 of 1901). Excellent quality, pen is unusually big, equivalent to a Waterman #6-size, nib has Eagle shield imprint, Masonic imprint on barrel for Martha Washington Lodge; cap more worn than barrel, two small stable hairlines in lip (see detail), front portion of barrel from barrel band forward has been restored. 13609: Esterbrook B: full-size "Dollar Pen", green pearl lever-filler, 12.1 cm long, stainless steel trim, later #9550 nib with round-bottomed feed. 10196: Eversharp Doric: oversize black first-generation lever-filler, 14.7 cm long, gold filled trim, Gold Seal, roller clip, massive Gold Seal manifold nib with semistub tip, screw-in Personal Point nib assembly, feed marked "B" for broad; black is one of the less common Doric colors. 9705: Eversharp Bantam set: red pearl miniature bulb-filler, 9.7 cm long, gold plated trim, plated #0 nib, matching 1.1 mm pencil; very lightly used, pen retains its original crimped-on rubber bulb -- very uncommon. Pen not usable as is, since the bulb is partially hardened. 12930: Eversharp Doric: slender full-length facetted lever-filler, 13.2 cm long, gold filled trim, screw-in Personal Point nib unit, "MANIFOLD"-marked #2 nib is smooth and precise; slight waviness next to lever, exaggerated in photo. 11879: Eversharp Skyline Demi: rare early production slender burgundy lever-filler with striped cap, gold filled trim, section with transparent ink window, standard short-model length at 12.2 cm long, but markedly slimmer (10 mm OD over barrel threads) -- parts do not interchange with any standard production pen; well worn but mechanically sound, gouges to barrel, lever sits slightly loosely at rest. To date we have found only a handful of examples of this slender model (Demis are normally shorter than standard Skylines but of the same thickness). 12666: Eversharp Skyline: rare early-production slender Demi model, black lever-filler with green pearl and black striped cap, 12.2 cm long, gold filled trim, two-tone nib, section with ink window. Parts will not exchange with later Skylines of any size, which are all of greater girth. A little-known variant -- read more about it here. 13576: Eversharp Skyline Demi: rare early production slender black lever-filler with gold filled trim and unusual cap trim configuration with wide band, narrow top band, and metal derby; standard short-model length at 12.2 cm long, but markedly slimmer (10 mm OD over barrel threads) -- parts do not interchange with any standard production pen. Section with transparent ink window, nib is single-tone but was probably originally two-tone; pen is mechanically sound, but has dings to the derby, a name on the barrel, and slight heat shrinkage irregularity behind the barrel threads. To date we have found only a handful of examples of this slender model (Demis are normally shorter than standard Skylines but of the same thickness). 13788: Eversharp Skyline: full-size "Army Navy" lever-filler, 13.3 cm long, gold filled trim, burgundy with blue striped pearl cap, wide cap band; excellent with no plating wear, some irregularity to crimping of cap band. 12522: Eversharp Skyline Command Performance: 14K solid yellow gold lever-filler, 13.7 cm long, no engravings, a few very shallow pinprick marks, some wear to the cap imprint; a smooth pressureless writer. 12163: Eversharp Streamliner: uncommon dark green economy Skyline version, 13.15 cm long, gold filled trim, simple clip, original price band; original sac has not been replaced, appears still supple but not guaranteed ink-tight. 12071: Eversharp Skyline $64 set: black lever-filler with smooth solid 14K gold cap, 13.4 cm long, matching injector pencil uses 1.1 mm lead. 13467: Eversharp Skyline Gold Award: uncommon version with full 1/10 14K yellow gold filled ribbed cap and barrel, 13.6 cm long, lever-filler, striking Machine Age design, two areas of stress cracks in barrel overlay (material probably made too hard), does not affect function, priced accordingly -- otherwise excellent. 13466: Eversharp Skyline Command Performance: 14K solid gold lever-filler, 13.4 cm long, less common blunt-ended barrel, smooth nib with semistub tip. 13789: Eversharp Slim Ventura: black squeeze-filler, 13 cm long, gold filled cap with sterling clip, original price and nib grade stickers on barrel; sac has been replaced. 13782: Eversharp Gregg: unusual black lever-filler, 13.25 cm long, gold filled trim, made for resale by the Gregg shorthand company and bearing an enameled Gregg logo in the cap top, and carrying a special Gregg-marked nib over a Skyline-style feed; Wahl-Eversharp made Gregg and Palmer Method pens from the 1920s on, but postwar examples are particularly uncommon. 13661: Eversharp Gregg in box: unusual black lever-filler, 13.35 cm long, gold filled trim, made for resale by the Gregg shorthand company and bearing an enameled Gregg logo in the cap top, and carrying a special Gregg-marked nib over a Skyline-style feed. Wahl-Eversharp made Gregg and Palmer Method pens from the 1920s on, but postwar examples are particularly uncommon, and this is the first example we have had with the original box and instructions. 13151: Gold Medal set in box: green and black striated button-filler, 13.35 cm long, gold filled trim, section with ink window, matching 1.1 mm pencil; both crisply marked with Art Deco "Buck Rogers" style clips. As new, noting bubbles and blobs in ink window. 12365: Houston eyedropper-filler: distinctive full-length mottled hard rubber ringtop, 14.9 cm long, gold filled trim, barrel imprint well worn and only barely legible, #2 nib is intact but center of imprint polished away ("MINN. U.S.A." on second line), tipping scant; original suspension chain and fitting attached. 13583: John Holland dip pen in box: #6-size takedown holder, gold filled with ebonized wood taper, 14.4 cm long excluding matching #6 John Holland gold nib. Flake missing from taper end (see detail), small stress crack in prolongation of the nib slit, appears stable. 8667: Kaweco safety: unusual black chased hard rubber clipless model, 12.7 cm long, with a ventless Hicks New York 18K gold nib with French hallmarks; condition is like new, but the original barrel imprint of this French-market pen appears to have been polished away -- most likely out of WW1-era anti-German sentiment. Early production Kawecos often carried New York-made nibs, but most were from A. Morton. 13813: Mabie Todd Swan Military Safety: uncommon screw-cap black chased hard rubber ink-tablet eyedropper-filler, 14.5 cm long, nickel plated trim, New York production but bearing retail imprint on cap top of Mark Cross of London; even fading, imprints legible, marked "PAT. APPL'D FOR", typical flakes off very end of ink compartment knob (see detail). 10461: Mabie Todd Swan Military Safety: rare screw-cap black hard rubber ink-tablet eyedropper-filler, 14.2 cm long, gold filled overlay. New York production, imprints and chasing crisp, some erosion around cap vent holes, feed shows signs of having been overheated during nib setting, but the pen is otherwise like new -- was found as part of a group of mostly new old stock Swans. Plain black hard rubber Swan Militaries are uncommon; examples with overlays are rare. 10826: Mabie Todd Swan 46 Eternal: oversize mottled hard rubber flat-top lever-filler, 13.9 cm long, gold filled trim, New York production, good color, imprints worn but legible, comb feed, big #6 nib imprinted "COWAPAMOSH/SHOP" is of excellent quality and very possibly was custom-marked by Mabie Todd for this Pittsburgh, Pennsylvania retailer. 10205: Mabie Todd Swan set in box: beautiful and solid New York-made lever-filler in 1/5 18K gold filled, 13.1 cm long, crisp rings chasing pattern (usually found on Edward Todd pens, but very uncommon for Mabie Todd). Matching 1.1 mm Fyne Poynt pencil, both pieces bear a neatly engraved 1928-dated inscription on their barrels. Nib is set tight, so writes a very fine line, but the tip is large enough that it could be adjusted to a medium fine if opened up. Set is like new with attractive age toning, no brassing but usual Mabie Todd seam lines visible where end caps soldered on pen. 9064: Mabie Todd Swan Self-Filling: rare and unusual black celluloid clipless lever-filler in the form of a turn of the century desk pen, 15.6 cm long, gold filled trim, imprinted "POSTING" next to the lever. A small number of similar pens were made by Mabie Todd earlier as hard rubber screw-cap eyedropper-fillers for a Pittsburgh stationer as a special order. This pen is also New York production and also not catalogued -- and at least as uncommon as the Pittsburgh pens. Like new condition, with minor shop wear. 9063: Mabie Todd Swan Self-Filling: rare and unusual black celluloid lever-filler in the form of a turn of the century desk pen, 15.3 cm long, gold filled trim. A small number of similar pens were made by Mabie Todd earlier as hard rubber screw-cap eyedropper-fillers for a Pittsburgh stationer as a special order. This pen is also New York production and also not catalogued -- and at least as uncommon as the Pittsburgh pens..
13942: Montblanc Agatha Christie: limited edition of 30,000 fountain pens, black piston-filler with sterling silver trim, all original packaging, broad stublike nib. 13473: Namiki Pilot Nomikomi-shiki in box: rare "easy-drink" filler in black celluloid, 12.3 cm long, gold filled trim, 14K gold export nib, original paper band on cap with hand-written price ($3.25). New old stock, fills by inserting pen into special inkwell (not included), inverting inkwell and pen together. Transparent celluloid internal reservoir tube intact, characteristic long-tailed feed visible through barrel ink window. Instructions in box are for a plunger-filler. 13472: Namiki Pilot A-shiki in box: rare demonstrator-like plunger-filler in transparent celluloid with black streaks, 12.85 cm long, gold filled trim, black ends, 14K gold export #3 nib, original paper band on cap with hand-written price ($3.75), barrel band lists US, British, and Dutch patent numbers. New old stock, original seals have not been replaced, pen not functional as is. In original box with instructions. 13373: Parker 24 New Style: an extremely rare slip-cap eyedropper-filler design, offered for only a very brief time (mentioned in Parker's Side Talks in 1899, absent from 1898 and 1900 Parker catalogs); mottled hard rubber, correct black hard rubber section, 14.45 cm long, #4 keyhole vent Lucky Curve nib, intact early narrow Lucky Curve feed, barrel imprint worn at ends but almost all legible. Tool marks and crack in section (see details), cap is a precise replacement made from original material. 13647: Parker 25 Click-Filler: extremely rare oversize hard rubber slip-cap self-filler, Parker's first (patent number 791,466); 15.4 cm long, imprints worn but present, #5 Lucky Curve keyhole vent nib is a notably elegant writer. Cap lip crack has been repaired and is virtually invisible from the outside, even under magnification. To fill, push front of nickel plated pressure bar with fingernail to unlock while depressing rear protrusion to flatten sac; pull same protrusion back to allow sac to reinflate and to relock the pressure bar with a "click". This is only the second Parker click-filler we have offered in the past 20 years in any size. #5 was the largest size sold, and rarely seen. 9095: Parker 47 in box: iconic black hard rubber "Pregnant Parker" eyedropper-filler, 13.3 cm long, gold filled trim, nicely colored pearl slabs, #3 Lucky Curve keyhole-vent nib; 1910-dated inscription on cap cartouche, box is well worn, with ink stains and spots of wear-through on the cloth exterior. Pen itself is very clean, with no brassing and unfaded hard rubber, noting some scratches on the barrel end, probably from posting the cap. Fresh to the market -- from our personal collection, bought out of an estate over 15 years ago. 9996: Parker 70: rare gold filled telescoping ringtop, 10.6 cm long, extends to 12.3 cm (excluding cap, which is not designed to post onto the barrel); overlay is crisp and unbrassed, name engraved very lightly on the cap, the inevitable two dings to the side of the bulbous barrel end. Intact Lucky Curve feed with notably smooth and calligraphic #3 Lucky Curve nib. 13997: Parker 20½ Jack-Knife Safety: black chased hard rubber screw-cap button-filler, nickel plated trim, 13.5 cm long, intact Lucky Curve feed, #2 Lucky Curve nib is broad, wet writer with notably easy flex. Hard rubber is crisp and glossy, imprints sharp and bold. 10935: Parker Black Giant: oversize black hard rubber screw-cap eyedropper-filler, 14.75 cm long, worn but sound, #12 Lucky Curve nib with downwards-bent tip writes a finely shaded line. A rare pen with a special provenance: its barrel is engraved "W. W. Vautsmeier/U. S. Army" -- Major Walter W. Vautsmeier, a flight instructor during WW1 who died in 1922 in the crash of the Roma, an Italian-made semi-rigid dirigible and the last US military airship to be filled with hydrogen (more background here). 13543: Parker Duofold Junior: red hard rubber bandless button-filler, 11.75 cm long, gold filled trim, strong large barrel imprint. 13297: Parker Duofold Senior: rare bandless black chased hard rubber oversize button-filler, 14 cm long, gold filled trim, "giant" imprint, "6�" on bottom of blind cap, dating pen to first few months of production of this model. Good sound example with even wear, strong barrel imprint, chasing all present, hard rubber has been professionally reblackened. 14000: Parker Jack-Knife Safety: black chased hard rubber button-filler, 11.4 cm long, nickel plated trim, notable #2 Lucky Curve nib, intact Lucky Curve feed, blind cap is an old unmarked replacement, damage to blind cap threads at end of barrel does not affect function, condition otherwise excellent. 13814: Parker button-filler: black chased hard rubber, long and slender, nickel plated trim, 13.7 cm long, Lucky Curve feed, later replacement nib with notably large tip. 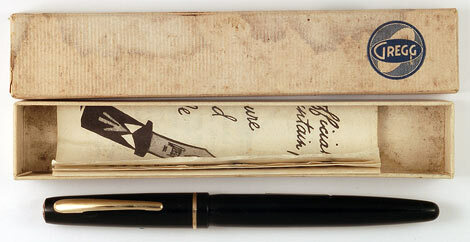 11319: Parker Duofold Senior set in box: classic black oversize button-filler, 14 cm long, GFT, early production in Permanite, raised single cap band with personal inscription, crisp milling on ends; matching "Big Bro" pencil with black hard rubber barrel shows more use, with bump to cap crown and scratches to nose cone (see details), box also shows wear with loose top. 13354: Parker Duofold Senior: large Mandarin Yellow button-filler, 13.8 cm long, gold filled trim, single raised cap band; nib has ruler wear on left tine, stress line from vent hole (stable, as the nib is quite firm), cap lip has been restored using original period celluloid, repair stronger than new and visible only from inside the cap. 13998: Parker button-filler: black line-chased celluloid "Black Line" flat-top, long and slender, 13.6 cm long, gold filled trim, hard rubber ends, Lucky Curve imprint and #2 nib, intact Lucky Curve feed. 12869: Parker button-filler: black celluloid "Black Line" flat-top, 11.2 cm long, gold filled trim, hard rubber ends, Lucky Curve imprint and nib, spearhead feed. 11540: Parker Lady Duofold Deluxe: Moderne green-veined pearl ringtop streamlined button-filler, 11.75 cm long, gold filled trim, good imprint, fine barrel color with only slight ambering, silicone sac has been installed (latex can be substituted upon request) to preserve color, comb feed and nib are factory replacements, nib has date code for 1949 and "R" signifying a replacement with Duofold guarantee. 13890: Parker Vacuum Filler: black "Crystal" Junior, 12.1 cm long, gold filled trim, transparent barrel configuration identical to factory demonstrators, but without the dealer-only markings; imprint weak but mostly legible, two-tone nib later with 1937 date code, back half of barrel has internal bubbles and slight shrinkage, probably from overheating, blind cap jewel a later replacement. Mechanically sound, a rare early proto-Vacumatic. 11610: Parker Duofold Junior: streamlined button-filler in Mandarin Yellow, 11.5 cm long, gold filled trim, Duofold nib is a precise smooth writer, spearhead feed; some staining to cap, cap lip has been replaced using vintage celluloid, stronger than new and invisible from the outside. 13989: Parker button-filler: uncommon black chased celluloid streamline model, 12.7 cm long, gold filled trim, made in Canada, broad #2 nib with flex. 13527: Parker Duofold Senior Deluxe set: oversize streamline button-filler in Moderne Pearl green and black, 13 cm long, gold filled trim, triple cap bands with wider central band, straong imprint, numbered Duofold Deluxe nib, comb feed; matching pencil uses 1.1 mm lead, color is slightly brighter than that of the pen. 11695: Parker Vacumatic Debutante set: silver pearl laminate, 11.85 cm long, chrome plated trim, Blue Diamond clip, striped section and end jewels, aluminum Speedline filler, two-tone arrow nib, fine barrel transparency, usual slight swelling over filler unit, good imprint with 3rd quarter date code; matching injector pencil has first quarter date code, uses 1.1 mm lead. 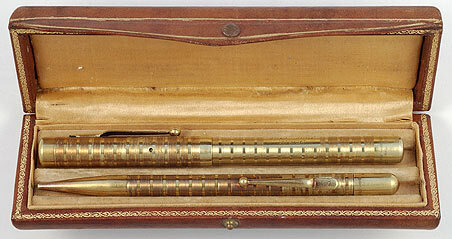 Both pen and pencil have matching extra-wide "jeweler's" cap bands, engraved "E. G.". 13819: Parker Imperial Debutante Vacumatic set in box: golden pearl laminate, gold filled cap with alternating pairs of squiggly and straight lines and cartouche, 12.3 cm long, black jewels, two-tone Arrow nib, aluminum Speedline filler, excellent imprint with 2nd quarter date code, excellent barrel transparency; matching .9 mm pencil has 3rd quarter date code on barrel, both pieces have a name on their barrels. 12966: Parker Vacumatic Debutante: silver pearl laminate with wide "jeweler's" cap band, 12 cm long, chrome plated trim, bold imprint with original silver infill but lacking date code, perfect transparency, appears to be new old stock, never filled (we have replaced the diaphragm), pristine. This pen came to us without a nib; we have installed a correct new old stock nib. 13667: Parker Victory Mark I: blue pearl and black marbled button-filler, 13.1 cm long, gold filled trim, made in England, bold writing calligraphic nib. 13944: Parker VS set: red-brown button-filler, frosty Lustraloy cap, chrome plated trim, 13.9 cm long, bold deep imprint with 2nd quarter date code, early production with plastic blind cap threads, black hard rubber feed; with matching .9 mm pencil. 13843: Parker 61: black capillary-filler, 12.8 cm long, stainless steel cap, gold filled trim, test-market design differing in several key respects from the full production version introduced in 1956: "61" logo pierced into gold undernib shield and barrel-end vent; integral barrel and hood construction; unique cap design, interior details shown in US patent 2,773,479, applied for March 1, 1952. Parker intended to put this design into full production until consumers rejected it during test marketing. Shallow dent to undernib shield, sealed hairline in shell at base of nib opening (see details), fully functional and otherwise excellent. 13850: Parker 51 Demi Special set: grey Aerometric filler with polished stainless steel cap, black jewel, with matching .9 mm twist-action pencil. Both pen and pencil are imprinted with the same name; pencil bears late "53" date code, barrel color appears to be the pre-Aerometric grey, differing from the pen's. Pen nib is gold, not Octanium, new sac has been installed. 13830: Parker 61 Classic: black capillary-filler, frosty Lustraloy cap, chrome plated trim. 13834: Parker 75: vermeil grid pattern, gold filled trim, early model with solid ends, short-feathered arrow clip, US-made, marked "STERLING/&14K G.F.", section with angle indicator, 14K nib, original clip hang tag. Cap tarnish will easily polish off, interesting (factory?) code engraved on barrel end. Uses standard cartridges or converter (not included). 13682: Parker 45: prototype with dark grey baked enamel finish over metal cap and barrel, gold plated trim, 14K nib, as new. 13420: Parker 75: sterling silver grid pattern, gold plated trim, made in USA, marked "STERLING CAP & BARREL", 14K nib marked "XF" on feed; section with angle indicator, no "0", very slightly canted off-axis (see detail); includes later piston-style converter. 13926: Parker 180 Écorce: gold plated, simulated bark finish engine turning, uses cartridge or convertor (included), made in France; two-way triangular gold nib, feed marked "X/M", writes extra-fine on one side, medium on the other; appears to be new old stock, no packaging. 11547: Parker 180 Laque: beautiful "Lapis" lacquer finish, uses cartridge or convertor (included), made in France; triangular 14K gold nib, feed marked "X/M"; no date code. 7552: Parker 180 Flighter: stainless steel cap and barrel, gold plated trim, US-made, includes Aerometric-style slender convertor, 14K gold two-way triangular nib (offers two nib grades in one, with a thinner line when the nib is used inverted); new old stock with original clip tag, several available. 10949: Parker Wood Pen: rare German-made limited edition cartridge/converter filler (slender metal-bodied squeeze-filler converter included), 14.3 cm long, gold plated trim, redwood cap and barrel, section band bears number 883, original sticker on back of cap. Cap is not made to post on the barrel end. Reportedly production of this pen was soon halted by Parker USA, well before the intended 2000 were made. 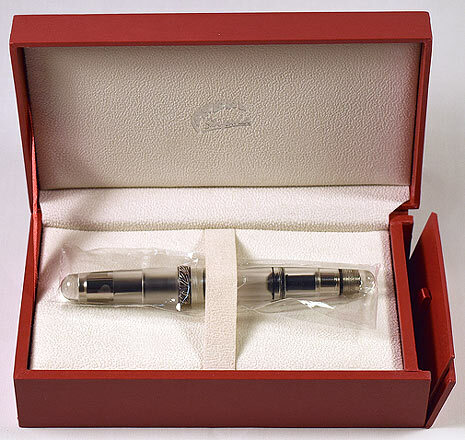 11980: Parker Wood Pen in box: rare German-made limited edition cartridge/converter filler (slender metal-bodied squeeze-filler converter included), 14.3 cm long, gold plated trim, cap and barrel in briar, section band bears number 904. Cap is not made to post on the barrel end. Reportedly production of this pen was halted by Parker USA before the intended 2000 were made. This is one of the less common of the eight different woods used, and is unusual in being accompanied by the special Wood Pen box, which appears to be made from redwood. 11551: Parker 180 Laque: beautiful "Thuya" lacquer finish, uses cartridge or convertor (included), made in France; hallmarked triangular 14K gold nib, feed marked "F"; "UI" date code. 13828: Parker 75 Flighter: stainless steel cap and barrel, chrome plated trim, made in USA, "AC" date code, section with angle indicator, 14K nib, condition as new, uses standard cartridges or converter (not included). 12586: Parker 180: gold-plated basketweave pattern, made in France, two-way flat gold nib, feed marked "X/M"; one of the less common patterns of one of Parker's lower-production pens; some roughness to plating of collar at end of section, otherwise as new; includes convertor. 7357: Parker 180 Guirland: gold-plated, made in France, two-way flat gold nib, feed marked "X/M"; one of the less common patterns of one of Parker's lower-production pens; new old stock, includes convertor. 12643: Parker Premier Chinese Laque set: fountain pen with speckled lacquer finish, gold plated trim, 13.5 cm long, onyx disks inset into ends; made in France, 18K French-hallmarked nib, section bears low "TD 4105" serial number imprint; as new, but no packaging, matching twist-action ballpoint uses standard Parker refills. 11670: Parker 180: gold-plated basketweave pattern, made in France, two-way flat gold nib, feed marked "X/M"; one of the less common patterns of one of Parker's lower-production pens; some usage marks at ends, includes convertor. 12564: Parker Duofold International set in box: green marble, cartridge/converter (converter included), 13.1 cm long, gold plated trim, made in England, notable factory italic nib came to us very scratchy, has been tuned and smoothed, now wonderfully calligraphic; pen has 1st quarter 1996 date code, matching 0.7 mm pencil has slightly later "E" date code. In original inner and outer boxes, with guarantee and instructions. 13033: Pelikan 400NN: piston-filler, 13.1 cm long, brown cap and turning knob, tortoiseshell striated transparent barrel, nib marked "KF". 13479: Pilot Super 100: black tab-filler, 13.2 cm long, gold plated trim, inlaid 14K nib, tab filler; scratches to the cap, a few marks to the tassie at the end of the barrel, otherwise excellent. 13351: Pilot Super 200: black tab-filler, 14.1 cm long, gold plated trim, inlaid 14K gold "SCRIPT" nib, clean barrel imprints, "HITACHI" on barrel. 9718: Rover safety: black hard rubber with gold filled overlay, 10.9 cm long, milled ends, translucent red inlay in cap crown; most Rover pens appear to have been made by other makers, and this example seems to be a Montegrappa product. Seals have been replaced, a good writer, in clean condition aside from some plating wear. 11792: Sheaffer Self-Filling: black chased hard rubber lever-filler, 13.5 cm long, nickel plated trim, crisp chasing and imprints, #2 Self-Filling nib is an elegant writer; excellent appearance, glossy hard rubber has been professionally reblackened, tight hairline crack in cap lip (see detail), post cap lightly. 13601: Sheaffer Lifetime: oversize black flat-top lever-filler, 13.45 cm long, gold filled trim, White Dot on cap top; celluloid section with ink window and fine-finned feed are later Sheaffer replacement parts but from the original working lifetime of the pen (late 1930s/1940s, most likely). Good imprints, name on barrel. 13717: Sheaffer Lifetime desk pen: black lever-filler, 19.6 cm long, uncommon reverse trim (chrome rather than gold filled), large White Dot, red trim band, two-tone Lifetime nib with turned-up nib. 13808: Sheaffer Univer: small black and cream flat-top lever-filler, 11.1 cm long, gold filled trim, strong barrel imprints, "UNIVER" marked nib, slight heat distortion at ends does not affect function, more felt than seen. 13571: Sheaffer Gregg Balance set in box: full-length slender striated golden pearl lever-filler, 13.8 cm long, gold filled trim, crisp bold imprints, section with ink window, #3 nib, Gregg shorthand symbol on barrel; matching pencil uses .9 mm lead. Condition as new but for very slight polishing wear to pen's lever. 13585: Sheaffer Lifetime Feathertouch Vigilant: black plunger-filler with military clip, 12.9 cm long, gold filled trim, White Dot, barrel transparency like new, "875" on barrel indicates original $8.75 price, two-tone Lifetime nib, barrel behind threads irregular and out of round due to heat shrinkage, but does not affect function (see detail), otherwise excellent. 11826: Sheaffer Defender: black WW2-era lever-filler, 13.15 cm long, gold filled over silver trim, over-the-top military clip, #5 Feathertouch two-tone nib, scratch at edge of cap lip is not a crack, some plating wear to nib (wartime plating was thinner). 9239: Sheaffer Lifetime Triumph Masterpiece set in box: lever-filler with solid 14K gold cap and barrel, 13.2 cm long, with matching .9 mm pencil; pen has a smooth-writing two-tone Triumph conical nib, section with transparent ink window with excellent transparency; presentation inscription on both pen and pencil, "FROM JOHN MABEE/TO MY GOOD FRIEND ART", overall condition excellent but for typical end dings on both pen and pencil (see photos). 13256: Sheaffer Lifetime Triumph Autograph: black lever-filler, 13.5 cm long, 14K solid gold trim, big smooth conical two-tone Triumph nib with turnup tip; facsimile signature on cap band, ribbed section with ink window, good barrel imprint, inlaid ivory-colored White Dot; excellent appearance, but some scratches towards end of barrel. 13642: Sheaffer Lifetime Triumph Autograph Tuckaway set in box: black plunger-filler, 11.5 cm long, solid 14K gold trim, White Dot, two-tone conical Triumph nib, matching pencil uses .9 mm lead; this set cost $35 when new. 13130: Sheaffer Tuckaway Sentinel: black vest pocket plunger-filler, 11.3 cm long, gold filled trim, stainless steel cap, section with transparent ink window, smooth two-tone Triumph nib, White Dot at end of barrel, minor scuffs at top of cap. 12038: Sheaffer Craftsman: black lever-filler, 12.8 cm long, gold filled trim, uncommon variant with Gregg shorthand symbol on barrel; sharp imprints, very slight swelling over lever retaining spring. 13110: Sheaffer Snorkel Sentinel: first-year black pneumatic-filler, 14.1 cm long, polished stainless steel cap, gold filled trim, White Dot, conical two-tone 14K gold nib with early narrow skirt, matching section, 14K solid gold Snorkel filler tube; initials "ETC" on barrel, imprint worn but fully present, one tiny bump to cap top. 13167: Sheaffer Snorkel Crest: burgundy pneumatic-filler, gold filled cap, White Dot, notable broad two-tone Triumph conical nib; Australian production, fully marked. 13696: Sheaffer Snorkel Clipper set in box: black pneumatic-filler, 14.1 cm long, patterned stainless steel cap, gold filled trim, White Dot, conical Triumph palladium-silver nib marked F4, with matching .9 mm pencil; nice clean set, one tiny mark on pencil clip, instructions in case under pad, some staining to box. 13921: Soennecken 222 Extra: uncommon blue-green snakeskin piston-filler, 12.85 cm long, gold filled trim, filler knob has locking mechanism: pull to release, then twist to empty or fill; barrel imprint sharp, also lightly marked "VERLAG DR. STOYTSCHEFF" on opposite side; noteworthy nib, smooth and lively. Condition excellent but for roughness to clip plating, depigmentation of aging celluloid around barrel threads (see details). 13931: Stipula Etruria Nuda in box: limited edition of 351, oversize transparent piston-filler, 14.3 cm long, solid sterling silver trim, 14K nib (white gold or white plated), sealed in factory bag, in box with all paperwork, outer sleeve. 12733: Stylomine 303: small black French pump-filler, 12.3 cm long, gold filled trim, semi-hooded nib, chalk marks on barrel, original accordion sac has been replaced by a conventional sac, fill pen by twisting transparent plunger instead of pressing (as described here). 13433: Unic Plextyl: large black button-filler, made in France, 14.3 cm long, gold filled trim, stainless steel Unic #6 nib; crisp imprints, clip is a replacement and of different design from the original. 13772: Unic pump-filler: oversize Deco-style in black, 13.5 cm long, gold filled trim, like new condition but original stainless steel nib (shown and included) corroded and replaced by a high quality gold plated stainless nib. 11571: United States Fountain Pen Co. Victor: black hard rubber screw-cap eyedropper-filler, 1/10 18K gold filled overlay with hand engraved floral pattern, 13.5 cm long; Walker Davison #3 nib is a high quality old replacement. Brassing to ends of barrel overlay, cap has toothmarks at end and two test cuts (see details) -- a pity, as 90% of the overlay is crisp and clean. 12573: Wahl lever-filler: early gold filled "all metal barrel" pen in "Zigzag" pattern, 11.7 cm long, raised lever and Sheaffer-licensed sprung pressure bar; large "WAHL" marked #4 nib, elegantly engraved initials in barrel cartouche. 13366: Wahl-Eversharp Gold Seal set: oversize green and gold "Deco Band" lever-filler, 13.5 cm long, gold filled trim, Personal Point nib unit, roller clip, rare and mysterious variant with "X" seal instead of the usual double check mark. Massive manifold Gold Seal nib, slight roughness to area around end of lever, nicks to bands at ends, shallow depression on side of barrel (probably from overenthusiastic spot polishing; not really possible to photograph). Includes matching pencil, uses 1.1 mm lead, has name on side, scrape marks, more heavily used than the pen. 13970: Waterman 324 Golpheresque: black hard rubber taper-cap half-overlay eyedropper-filler, 14.5 cm long, gold filled overlay has name engraved in cartouche, test mark just above (see detail), cap imprint is worn but legible, with no globe logo; Spoon Feed is an early example with 1899 patent date imprint, no number on end of barrel. Clip was added in the later 1920s. 13613: Waterman Remex: black chased hard rubber slip-cap eyedropper-filler, 12.8 cm long, narrow 3-fissure long-tailed feed, Remex nib is an elegant writer, good imprints and chasing, though crisper on the cap than on the barrel, moderate even fading. 13606: Waterman 412: black hard rubber eyedropper-filler, early pattern .999 fine silver Art Nouveau filigree overlay, 13.35 cm long, feed with patent imprints, imprints on overlay nice and legible, noting nicks and digs to the silver (see details). Hard rubber has been professionally dye-reblackened. 11773: Waterman 222: rare black hard rubber taper cap eyedropper-filler with .999 fine silver Art Nouveau filigree barrel overlay, 14.6 cm long, Spoon Feed with patent date imprint, early #2 New York nib; imprints on the silver are all present and legible, noting light toothmarks at barrel end. 13551: Waterman 412: early black hard rubber eyedropper-filler with .999 fine silver filigree Art Nouveau overlay; 13.5 cm long, #2 New York nib, spoon feed with patent imprints, imprints on cap, top and bottom of barrel overlay. Moderate fading to the hard rubber, which has not been reblackened. Fine silver overlays are much scarcer than later examples in sterling. 10903: Waterman 402: slender black hard rubber straight cap eyedropper-filler, sterling silver overlay in fine barleycorn pattern, full London hallmarks with date letter for 1904/5; 14.35 cm long, Waterman globe logo on posting end nice and legible, "Eva" engraved in barrel cartouche. Patent date imprint on narrow spoon feed, unusual nib with very wide factory italic tip. 12680: Waterman 18: historically significant -- earliest known example of this oversize model, with 1898 dated cap imprint and vanishingly rare "PAT. APL'D FOR" imprint on Clip-Cap; 14.3 cm long, smooth black hard rubber eyedropper-filler, deeply rounded ends, barrel imprint without 1903 patent date, big #8 nib with early imprint. Full writeup of this pen here. 11341: Waterman 412: early black hard rubber eyedropper-filler with .999 fine silver filigree Art Nouveau overlay; 13.1 cm long, #2 nib with "N.Y." imprint, spoon feed with patent imprints, imprints on silver light but legible; hard rubber under the overlay has been professionally reblackened. Fine silver overlays are much scarcer than later examples in sterling. 9134: Waterman 402: black hard rubber straight-cap eyedropper-filler with enameled sterling silver overlay, 14.1 cm long; English-retailed, with the posting end marked "CALLOW OF MOUNT ST. MAYFAIR". Very clean, with no dings, or any tool marks to the posting end, though there are losses to the original inlaid white enamel stripes which have been restored with what appears to be cold enamel of a darker color -- losses which involve only the frontmost part of the barrel overlay, but the better part of the cap (condition otherwise would be excellent). Factory-made Waterman overlays with enamel work are extraordinarily rare, and appear to have been made only for a handful of ultra-luxe European retailers. This is only the second example we have seen in over 20 years of collecting. 11501: Waterman 43: rare desk pen, short-lived model, black hard rubber slip-cap clipless eyedropper-filler with long tapered barrel, 17.3 cm long; uncommon #3 New York nib is flexible but not soft, barrel imprints bold, scrape marks to feed. Moderate even fading, two longitudinal cracks in barrel (one virtually invisible, see detail; perhaps from pen being caught in a desk drawer) have been internally sealed, pen is ink-tight. 6130: Waterman 14: black hard rubber eyedropper-filler with fluted gold filled overlay and bloodstone cap top seal; 13.3 cm long, a rare but fully catalogued factory model most often found in France and England (a version appears on p. 53 of Waterman's 1908 USA catalog under "Special Mountings" as Emerald End Special Fluted, priced at $50 -- more than three times the cost of a full sterling silver Snake); French hallmarks, no dings, but one small test mark on the seal bezel, imprints on posting end worn but mostly legible; #4 New York nib, spoon feed with patent date imprints. 3779: Waterman 12P: rare black chased hard rubber pump-filler, 14.8 cm long, good imprints with 1897 and 1900 patent dates; moderate, even fading, a nice clean example of one of Waterman's earliest and least successful self-fillers. 13303: Waterman 412S Filigree: early black hard rubber safety with sterling silver overlay, 12.8 cm long, threaded turning knob, early mechanism with helically-grooved barrel interior, nib turns as it is extended and retracted, #2 New York nib has a few marks from past restraightening, easy soft flex. Hard rubber shows even fading to dark brown, good imprints, silver nicely patinated, internal mechanism repaired, seals replaced. 11573: Waterman 432: rare short version, black hard rubber eyedropper-filler with sterling silver London-hallmarked barleycorn overlay, 11.1 cm long; no model number stamp on end, as is typical of British-market Watermans. Feed with patent imprints, long internal tail, notable nib with massive tip. 9874: Waterman 0552: black hard rubber lever-filler, 13.8 cm long, gold filled "Gothic" pattern overlay, earlier production with 18K gold filled mark on clip, globe emblem on metal filler piece in lever head recess; nice smooth responsive #2 New York nib, not great line width variation. End number worn off, though imprint on side of posting end quite strong. Nicely engraved monogram on barrel, metalwork crisp, only a couple of dots of brassing. 13424: Waterman 42½V: black chased hard rubber clipless vest pocket safety, 8.8 cm long, made in USA for French market, French-hallmarked 18K solid gold barrel bands, 18K gold New York nib; even fading and wear, mechanically sound. 8908: Waterman 0552½ Gothic: clipless black hard rubber lever-filler, gold filled checkerboard pattern overlay, 13.6 cm long; initials on barrel, trace plating wear at top edge of crown, but otherwise extremely clean with bold posting end imprint and unfaded glossy black hard rubber; no trace of model number imprint on end, appears never to have been there; notable nib, very fine yet with a good degree of flexibility. 10678: Waterman 552½ LEC: black hard rubber lever-filler with solid 14K green gold overlay in Sheraton (grouped parallel lines) pattern; 13 cm long, light bumps to ends, barrel engraving has been covered with a matching solid gold plate; nib has a very fine tip, opens up to a considerable degree with slight pressure. 12883: Waterman 0552½V Filigree: black hard rubber ringtop with gold filled overlay, 9.4 cm long, very clean example, initials "ES" on barrel, specks of plating loss at the very edge of the end of the barrel. Nib is a smooth writer with light pressure, controllable toothiness if made to flex. 10712: Waterman 452V: black hard rubber lever-filler, sterling silver overlay, 11.4 cm long, a three-quarter length French-market model with covered barrel end and no model number imprint, the engine turning pattern similar to the USA "Gothic", but different. Full French hallmarks, 18K gold nib is responsive and slightly toothy, some shallow bumps to the barrel overlay (see details), lever is nickel silver rather than sterling (appears to be original, as plate under lever end is matching). 11255: Waterman Patrician: oversize black hard rubber lever-filler, 13.75 cm long, gold filled trim, emblem version with extra-wide solid cap band with enameled Lions badge -- a very rare pen, but heavily restored: cap lip has been replaced, sealed crack above clip, lever box is from a Hundred Year Pen, barrel imprint nearly completely worn away. 13228: Waterman 94 Ripple: Rose Ripple hard rubber lever-filler, 12.85 cm long; crisp and glossy, no brassing, sharp imprints, traces of silver infill on model number at barrel end, #4 nib is fine-tipped but still offers nice shading with normal writing pressure. Interesting special barrel imprint, "FRIENDLY FIVE SHOES/FIVE DOLLARS" (more on Friendly Five here). 13287: Waterman 51V Ripple: rare red and black hard rubber lever-filler, an export model distinguished by its singular #1-size nib, 10.7 cm long, nickel plated trim, good imprints, fine color, slight even fading. 11621: Waterman 41: rare woodgrain red and black hard rubber slender clipless safety, 11.4 cm long, crisp and glossy, almost no signs of use, later Waterman nib may indicate closeout model, assembly from new old stock parts. 13994: Waterman 454 Moderne: black hard rubber lever-filler, sterling silver "Night and Day" overlay, 13.7 cm long, #4 keyhole-vent "Brown" nib writes an elegant shaded line. Number on barrel end weak, partially heat-reversed, clip has been re-riveted. A good clean example of a scarce and desirable Art Deco classic. 13288: Waterman 32½: unusual slender lever-filler, 12 cm long, chrome plated trim, striking burgundy-copper pearl with bright red inclusions, both the material and the model normally seen only in Canadian production. This pen, however, is USA-made, apparently for export, and fully marked; lever is of later design, but may well be original, some heat distortion to the cap around the threads, nib is badly cracked from the vent hole and is not usable as is. Sac has been removed, section assembly cleaned. 12873: Waterman Crusader Taperite: black lever-filler, hooded nib, 11.8 cm long, frosted aluminum cap is very clean but for patch of abrasion on back. 13588: Waterman C/F: black cartridge-filler, 13.5 cm long, stainless steel cap, gold plated trim, made in France, 18K gold nib has slight waviness on tines, does not affect writing. 13532: Webster Four Star: striated silver-grey pearl twist-filler, 13 cm long, gold filled trim, section with transparent ink window, Four Star nib with turnup tip, over the top military clip; a true twist-filler directly descended from A. A. Waterman, here made for retail by Sears as an own-brand pen of excellent quality. 13999: unmarked eyedropper-filler: black chased hard rubber vest pocket screw-cap, 10.2 cm long, gold filled trim, fancy cap band with "O" initial engraved, warranted #2 nib is a smooth wet writer with a semistub tip. 10568: unmarked safety: black hard rubber, small and slender with silver overlay; 9.45 cm long, French made, 18K warranted nib is serviceable but toothy, tipping scant.